Positron’s FlexStream FS-GIGA Ethernet Access Device (EAD) offers service providers a cost-effective multi-pair bonded VDSL2 Ethernet over Copper (EoCu) and Gigabit Optical solution. The FS-GIGA also supports new G.hn and G.fast standards for up to 1 Gbps services over existing Telephone or Coax wiring to businesses in Multi-Tenant Units (MTU) buildings. This solution is ideal for the delivery of managed Ethernet services for business customers, small cell backhaul and other demanding applications. 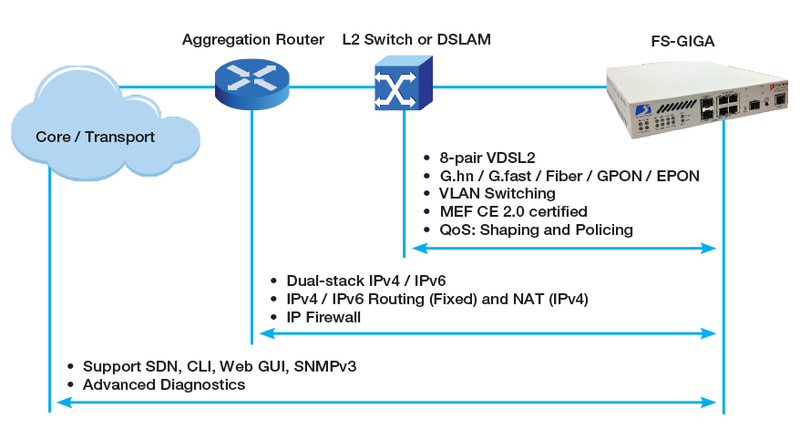 As a CE 2.0 certified demarcation device (NID), the FS-GIGA facilitates the provisioning, monitoring and control of end-to-end Ethernet services with comprehensive support for SLA enforcement. The FS-GIGA is specifically designed as a carrier grade solution to provide Ethernet services for business Internet access, MTU, small cell backhaul, L2 VPN, streamed video and Gigabit connectivity. It is environmentally hardened to provide service providers the flexibility to place the unit inside a building or in an outside plant cabinet. The FS-GIGA interfaces naturally to an Ethernet switch or to a 3rd party DSLAM/ MSAN over multi-pair VDSL2 with comprehensive support for VLAN and Metro Ethernet Forum standards. It also provides support for G.hn and G.fast via any of its gigabit SFP ports. The Layer 3 features of the FS-GIGA make it the ideal “light touch” IP Router to complement the role of the aggregation router at the edge of the core/ transport network infrastructure. The FS-GIGA supports the simplicity and scalability of SDN to further facilitate the delivery of Managed Ethernet Services. Turning on wholesale and business Ethernet services has never been easier. Of course, the FS-GIGA also offers comprehensive support for SNMP, CLI and web GUI management interfaces. The FS-GIGA is a standards-based 8-pair VDSL2 and ADSL2+ EAD which provides network operators the means to deliver advanced Ethernet over bonded copper services to business customers at minimal cost over their existing copper infrastructure. The FS-GIGA is fully standards compliant and interoperates with leading 3rd party DSLAMs from Nokia, Calix, Adtran, Huawei and others. When using Vectoring and Impulse Noise Protection (G.INP), the FS-GIGA delivers the best possible VDSL2 performance under all conditions. The FS-GIGA is an ideal platform to distribute a managed Ethernet Business Service to multiple tenants on any floor of a business building (MTU). With support for multi-pair VDSL2, G.hn and G.fast (both over copper or Coax), Ethernet (Cat 5/5E/6) and fiber (active, GPON or EPON), the FS-GIGA is completely agnostic to any wiring that can be found in such an MTU environment. By leveraging the CE 2.0 capabilities of the FS-GIGA, an Operator can deliver services with guaranteed bandwidth to individual tenants that are backed by Service Level Agreements (SLA). The Service OAM features of the FS-GIGA provide precise delay and jitter measurements for pro-active monitoring and management of the E-LINE, E-LAN or E-ACCESS service.